Earlier this week, his head coach, Dave Rennie, made a point of highlighting that the English champions are very good at creating a bit of niggle when things aren’t going their way, which puts the opposition off their stride and lures them into conceding soft penalties. 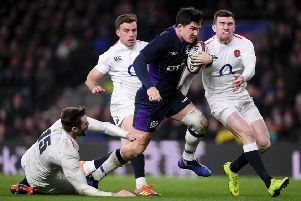 The New Zealander was speaking from first-hand knowledge, having been frustrated at some of the antics from the likes of Maro Itoje during the two previous occasions the sides have met this season. Rennie actually highlighted a specific incident in the first of those matches at Scotstoun back in October, when Warriors were awarded a penalty only for it to be reversed when Brown got embroiled in a fracas after the whistle. Saracens stand-off Owen Farrell kicked the three points which shifted the visitors into a 13-3 lead just before half-time, which was how the game ended after a stalemated second-half. Brown reckons he and his team-mates have learned from that game, and from the equally hard-fought return fixture three months later. This weekend promises to be another edgy encounter, and the key to success could be in who keeps the calmest head in the heat of battle. “I think so,” he replied, when asked if street smarts was going to be a key issue this weekend. “But, I think, you’ve got to play well, and you’ve got to be demonstrating to the referee that you are trying to play well to begin with. We’ve got Nigel Owens as the referee this weekend – he’s refereed god knows how many games – so he knows all the tricks. So, you’ve got to prove that you are in the ascendancy. “That’s particularly the case at scrum time. You’ve got to show that you want to be positive, that you want to scrum, that you want to use the ball, and then hopefully on the back of that the referees will give you the right decisions. Second-row Itoje is the arch-agitator for Saracens. Famously, he mock-celebrated with the Glasgow Warriors players when he realised before they did that the try they had just scored a during the second half of that game at Scotstoun had been disallowed. It was picked up by the cameras and became a real talking point in terms of the values of the game, but Brown clearly didn’t want to get embroiled in that old debate. “It happens,” he said. “You are just trying to wind people up on the pitch, and players do it to everyone all the time. “Guys like Maro like to give their energy and get their energy from performing like that. So, they celebrate if they get a knock-on or a penalty, and it is very visual. But in our games against the likes of Munster and Ulster, there is always niggle in there as well – it is good, it shows the passion of both teams – that they are up for it and want to play. “Maro is such a good player,” Brown added. “He’s always to the fore for them – he’s pivotal in both attack and defence – and he’s very visual when he celebrates.